BKW Consumption based at 80% over all Mechanical Efficiency. In view of continuous Research & development the information contained in this brochure is just to modification with out notice. Jacked Triplex Pumps giving guaranteed Against any defect in design, Manufacturing or faulty workmanship. For a period of Twelve months from the date bof Installation. All the Triplex series Pumps are designed for almost any medium .Selection of Specific Material for the Liquid end part depends on the physiacl & chemical Properties of the liquid to be handled. • The liquid end part can be quipped with cooling. 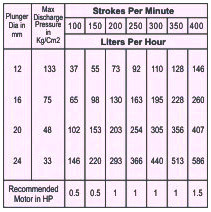 Heating or Flushing Systems depending upon theapplication. 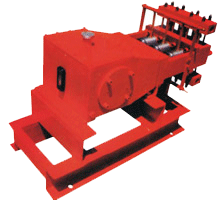 • The Plunger Cylinder unit is an excellent arrangement in terms of safety and maintainance. High performance non return valve son suction and delivery side . highly Convenient for maintenance. 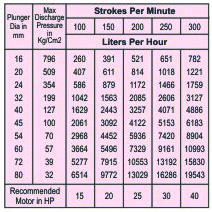 Power end parts are lubricated by splash type arrangement or forced lubrication. Crank shft is in high quality forged steel & supported by antifriction bi-mettalic bearings. Sturdy balanced Designed , Easy for maintenance . 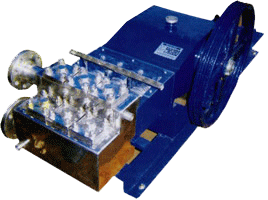 Drives - Direct, Geared, Belt pulley type . Hydro testing at Tanks, Vessels, Pipes, Valves, Fittings, Hoses . Injections - Boiler Feed, Gland Sealing, Fuel OIl, Reverse Osmosis, Water & Waste treatment. Jetting Boilers tubes, Heat Exchanger Tubes . Pressure Cleaning - Vehicales, tanks, Shop Floors, Pipes, Points, Air Crafts, Wagons. Spraying - Agricultural , Fire Fighting, Spray Drying. 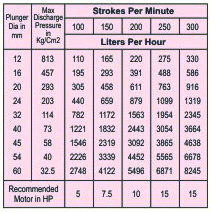 • Trolley, Hose, Gun, Pressure, Relief Valve.